She is easily the longest tenured university president in the Philadelphia area, and for that matter, in this day and age very few people hold the same position of any kind for more than three decades. Even more unique, not many people spend their entire working life in the same complex within a few miles of their childhood home. 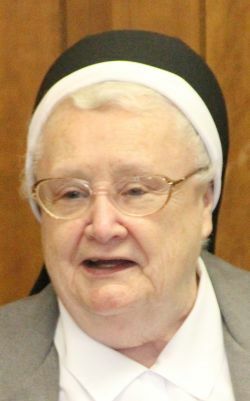 Born in the Mayfair section of the city, Sister Francesca, who was then Patricia Clare Onley, attended St. Matthew School and then went on to Nazareth Academy High School just a bit north in Torresdale, little realizing how profoundly this would affect her life. Her teachers were the Sisters of the Holy Family of Nazareth, the congregation that a few months after her 1950 graduation from Nazareth Academy she entered at age 17. In religion she was given the name Francesca for St. Frances of Rome, who was also the patron saint for Mother (now St.) Franciszka Siedliska, the foundress of the Holy Family Sisters. Two years later her younger sister, Joan, followed her into the congregation, taking Michael as her name in religion. At the time the two main apostolates for the congregation were education and health. Sister Joan, now retired, ultimately became a radiologist while Sister Francesca was assigned to the field of education. In 1953, after her religious formation, Sister Francesca was immediately assigned to classroom teaching at Nazareth’s grade school while taking college courses in the evening and Saturdays. Holy Family College opened on the same campus as the academy in 1954, and it was from there she received her bachelor’s degree in education and business in 1959. In 1965 she moved over to the high school division, serving on the faculty and rising to assistant principal and then principal in 1972. In 1981 she was named assistant to the president of Holy Family College and the following year became president. Meanwhile she had not been neglecting her own education, earning her MS in secondary education and business from Marywood College in 1968 and her PhD in higher education administration from Southern Illinois University, Carbondale, in 1986. At its foundation in 1954 Holy Family was a Catholic residential women’s college granting degrees in education with nursing added a short time later. After a time the residential program was eliminated and it became strictly commuter. But it was uniquely placed as the only college located in growing Northeast Philadelphia, the last part of the city to fully develop. It also remained a bastion of Catholicism long after most Catholics had left North Philadelphia and West Philadelphia for the suburbs. It was also among the first of the Catholic women’s colleges to become co-ed. “They did that in the 1970s and it was a smart move,” Sister Francesca said. When she became president, Holy Family College had 1,281 students, all undergraduates, of which only about 500 were full-time day students. A particular challenge for Holy Family was that it was land-locked, built as it was on what had been the western portion of the Nazareth Academy campus. Under her leadership land was acquired in Newtown, Bucks County, for a satellite campus and other sites in Bensalem and South Philadelphia. The Newtown property was the biggest coup. Almost immediately after its purchase a portion of the land was sold for more than the purchase price of the entire tract. “It was called the Outstanding Deal of the Year in the Philadelphia area,” Sister Francesca recalls. With financial transactions like that it is small wonder she was elected chairman of the board for the Greater Northeast Philadelphia Chamber of Commerce. Under her watch, the once undergraduate-only college expanded to university status in 2002 and now Holy Family offers a doctoral degree in education and master’s degrees in education, criminal justice, counseling psychology, human resource management and information systems management. Most recent figures show enrollment has increased to approximately 3,000. However, if you ask Sister Francesca of what she is most proud, it is not the things the university has done. It is the things that have never changed. Just as it was in 1954 when Holy Family College opened its doors, the school under Sister Francesca’s leadership remains solidly Catholic to the core. At this point in time as she is relinquishing the reins of administration, “we are in good shape and we have to move ahead. Different times need different ideas,” she said. That may well be, but don’t look for future pictures of Sister Francesca Onley in a rocking chair.